Allow me to start by sharing with you some statistics on the distribution of hours for different managerial activities. “A meeting is a gathering where people speak up, say nothing and then all disagree,” says Thomas Kayser, author of Mining Group Gold. This quote and the chart above clearly reveal how a meeting without focus or objective will degenerate quickly into a waste of time and energy. The fact that you are spending 69% of your work hours in meetings doesn’t necessarily mean you are getting the work done. Conducting a focused and productive meeting in this busy, always-on period is getting to be more and more of a challenge. To help you tackle this challenge of how to conduct successful meetings, I have put together a 5-step meeting planning checklist. The size of the meeting – depends on the meeting type. A more than required number of members will disrupt the flow of thoughts and prevent all members from contributing. It will also make arriving at a consensus more difficult. The chart below will help you keep the size of the meeting to optimal, based on the type of meeting. Meeting durations – will vary, but the attendee attention span is 52 minutes. This is a very relative term and differs according to the meeting type. It is said that, in general, an attendee’s attention span is 52 minutes. 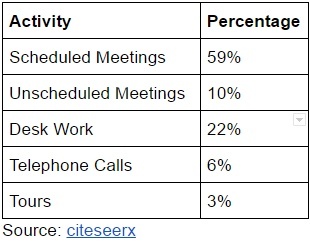 But, as various studies show, on an average a meeting lasts for 1-1/19 hours. Going by this numbers, a sheer waste of around eight to twenty-seven minutes of valuable time. 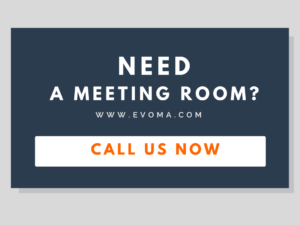 Best time to hold your meeting – Tuesday at 3:00 p.m.
Studies by When is Good show that Tuesday afternoon at 3:00 p.m. is the best time of the week to call your meeting to order. The attendees are well over their Monday morning blues, and yet to get into their weekend mood. Note taking – longhand wins over laptop notes. Though the factual knowledge recall is more or less about the same, taking notes by hand easily scores over note taking by the laptop when it comes to conceptual recall. Role of the Chair – define agenda, objectives and desired outcomes. Establish meeting rules and protocols. An informal and non-punitive set of rules to help conduct the meeting smoothly and effectively. The chair should not dominate the proceedings and suppress or disregard other’s opinion. The chair should be impartial and unbiased. Not to allow the proceedings to be cornered by any single person at the expense of others. Delegate relevant responsibilities for individual objectives to Points Personnel. Doing so provides accountability for that individual to ensure that the task entrusted to him gets done. Also, due to their specific area of expertise, they can describe the process and outcomes more clearly than anyone. Review the agenda and highlight key objectives and their relationship to other less critical objectives. Ensure members stick to the agenda and off-track discussions are re-focused immediately. Conclude an agenda point to its logical end before proceeding onto other points. Ask for questions and concerns and ensure that the team is on board before proceeding on. Pace the meeting to be within the time schedule. Always end the meeting by defining next steps, individual responsibilities and deadlines. Records should be maintained for the same for easy review. Fix the schedule for the next meet. This will enable addressing any scheduling conflict then and there.